← Teacher’s Last Class Retirement Party Invites! These are so cool. I love a new and creative idea! Hello, Just dropping by to let your know I recently posted about my project using the spray foam to hold sticks in place. I credited you and this post which I discovered on Pinterest. I used your photo and credited your site. Thanks for sharing. You’re project turned out great! Glad I could help inspire you on the setting part. Thanks for tag too! Thanks for the trick. I had already decided on this for my centerpieces next may when I get married but I didn’t think about using the spray foam. BRILLIANT! I’ve used that stuff before and it always goes bigger than I expect it will. I like the moss idea as well. I am going to use silver ceramic cube pots and I will set them in the middle of a floral ring of flowers. I can’t wait! it’s going to be so pretty. What an AMAZING BRILLIANT idea! I know I’ve needed something like this before, and have even used the spray foam before, but it never occurred to me to use it this way. I’ve already pinned it so I can remember it later. Thanks so much for sharing this awesome tip! This is a really great idea! 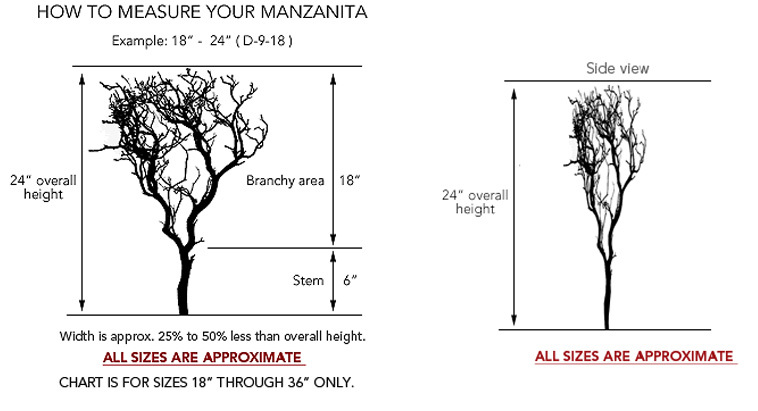 I have lots of manzanita branches (although mine were much more costly!!! I got ripped off! ), and I would like to set a few semi-permanent ones. I have been staved off by the same things you describe: cost, time to mix the plaster, etc. This seems SO much easier, quicker, and less messy!!! I’m going to give it a whirl once the humidity around here settles down. Thanks! Great tutorial! I just placed an order with Save On Crafts for a few of the branches. Keeping my fingers crossed that they will be really good ones. Thanks again for the web site info, and have a great weekend! Glad to know the tutorial helped! I’ve used this trick since this blog entry to set some fake plants in decorative pots too. So much cheaper than plaster or even the green foam blocks! Good luck with your project! What is the total cost and time you have spent on this project? I cannot recall the exact total price, but I do remember that the burden of the price falls with the Manzanita branches. 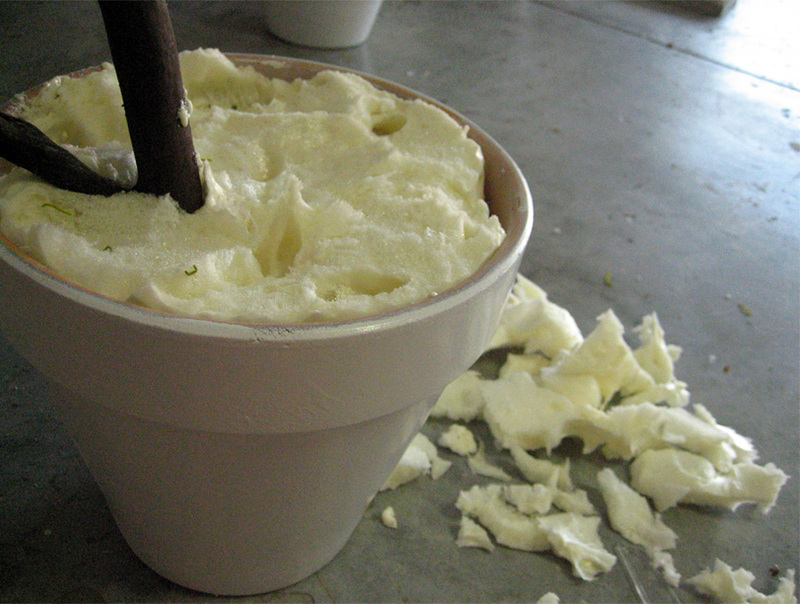 The ancillary items like the terra cotta pots, expanding foam, and spray paint are nominal. If I had to estimate (forgive my brain a bit, I made all this over two years ago), I would say it is under $15 for each table, including the branch decorations. I am not sure of current pricing, but it is still definitely cheaper than other table centerpiece options of similar size. If you opt for fancier pots as well (like for a wedding), the price will go up per centerpiece. Hope this helps! I was just about to start making manzanita centerpieces with my daughter for her upcoming wedding when I saw your blog, and how thankful I am! 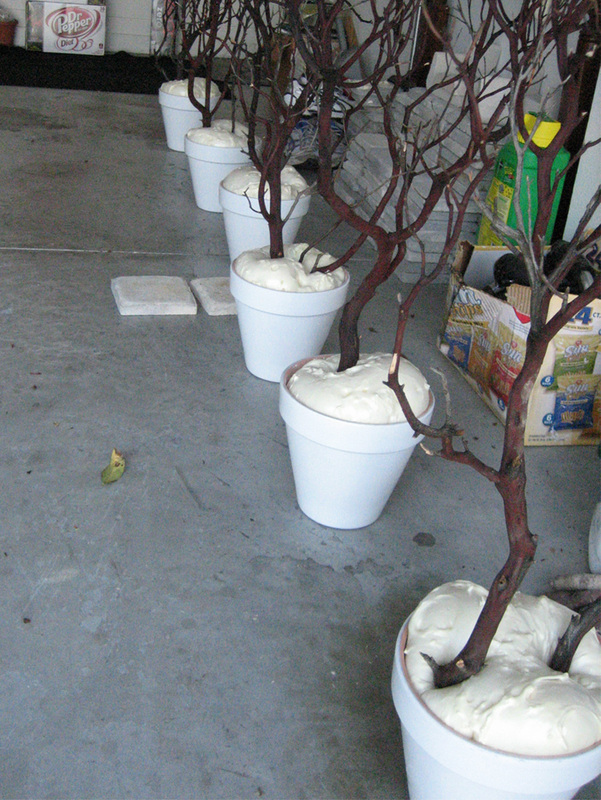 We weren’t sure how to secure the manzanita so we purchased mortar as plaster of paris was so expensive. What a costly big mess that would’ve been! We’re about to start and feeling so much better about the process now that we have a better direction and good instructions to follow. Thanks so much!! Follow up – Made the manzanita centerpieces just as you described, they came out great, and we’re all ready for the wedding in three weeks. We plan to sell them afterward on Craigslist as they should get more than one life! Yay! So glad everything went smoothly! 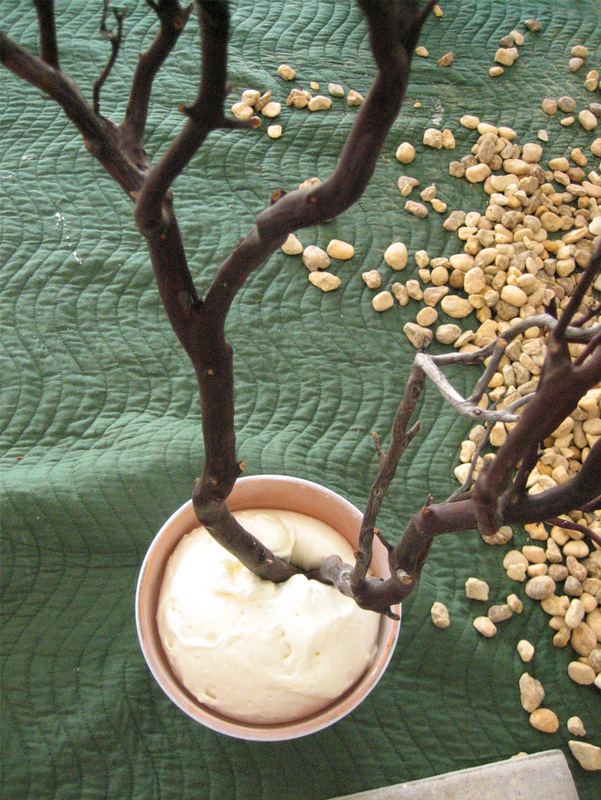 I sold my centerpieces on Craigslist too– excluding one which I kept to use to decorate for holidays. If I recall, it does get hard when fully cured. I started cutting away the excess when it was about 80-90% cured. At around $4, you could always give it a try. Hope that helps! I heard open cell foam dealers cute soft is this true, and what brands would you recommend? Reblogged this on White Rabbit Vintage Shoppe. Dallas, TX. I’m planning to do these to surround the dance floor, except I’m going to scatter silk fall leaves at the base and battery operated lights in the branches. I love this idea! We’ll be adding lights to hopefully make some nicer floor lighting for our outdoor reception. 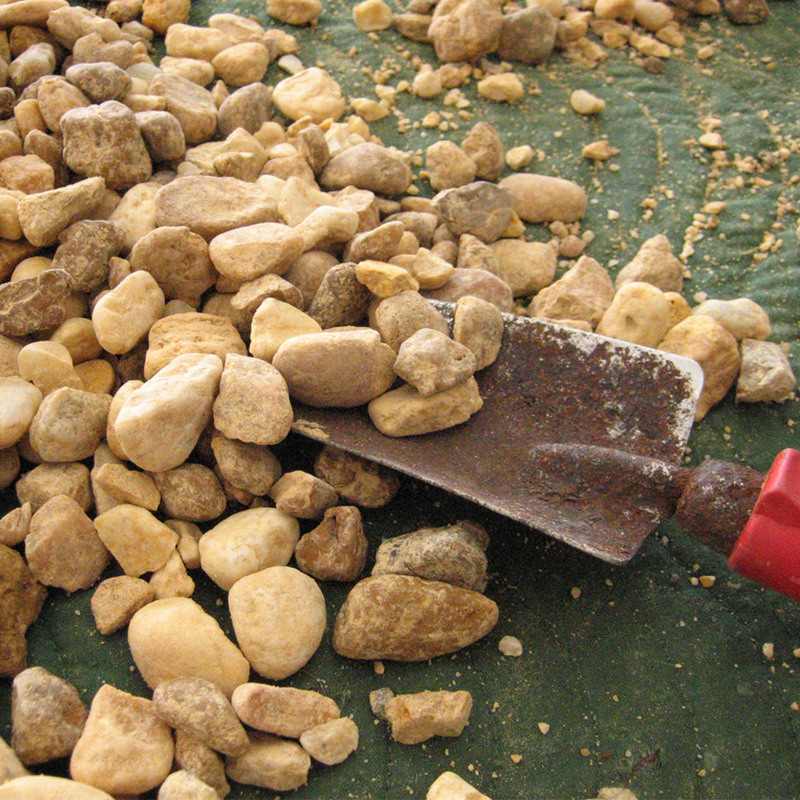 What sized pots did you use? My pots were rather small– I want to say 10″. But I’m sure it will be beautiful if you had these with lights. Great idea!! This looks great! 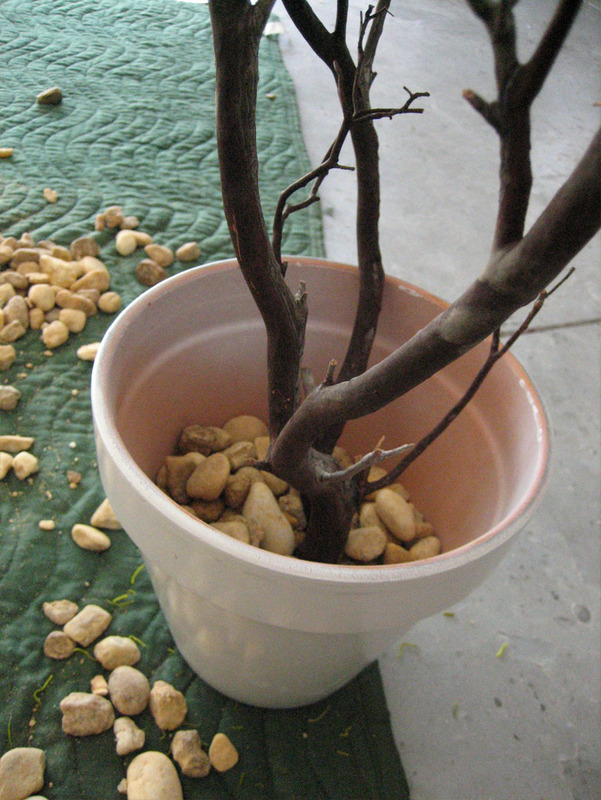 Will it work with a 42″ tall manzanita branch if I use a larger pot? Definitely! The only tricky part will be supporting the branches until the foam dries. I also recommend weighing the bottom down so it doesn’t topple over due the increased height. Looking to make wall decor. Nettleton Hollow is now over $100 for just 4 branches, so I’ll skip them. Sav-on Crafts is way more affordable at bout $9 a branch. Hoping it turns out as good as yours.